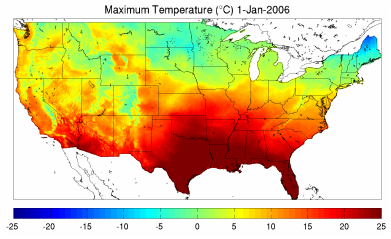 The University of Idaho gridMET gridded surface meteorological dataset covers the continental US from 1979-present mapping surface weather variables at a ~4-km spatial grain. This dataset is updated daily. 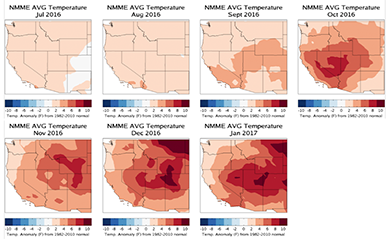 Seasonal climate forecasts for the next seven months were downscaled from 7 models of the North American Multi Model Ensemble (NMME) to a ~4-km spatial grain across the western US for compatibility with the gridded weather data. 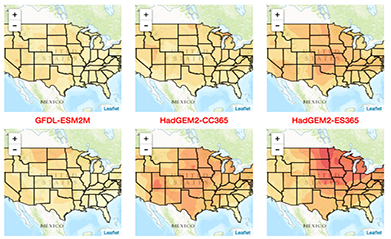 Projections from 20 climate models and 2 scenarios were downscaled to a ~4-km resolution across the US for compatibility with the gridded weather data.